Callum McGregor insists mental toughness will be as vital as physical strength in Albania if Scotland players are to lift the gloom that has descended on the national team. The negativity levels have grown this week, with John McGinn becoming the latest player to pull out of Saturday evening’s clash, due to a calf strain. However, McGregor remains confident that Alex McLeish’s depleted squad can still secure top spot in the section, with a decisive double-header concluding when the Israelis visit Hampden next Tuesday. And he believes the mindset of those selected will be every bit as influential as their technical or tactical abilities. ‘Certainly (it will be) away from home,’ admitted McGregor ahead of the match in Shkoder. ‘We had a tough night away in Israel and it’s about the mental state of the players as much as anything. ‘We’re all good players and we’ve all shown that at club level – but it’s about trying to bring that and harness the team spirit. We want to get the country to a positive place where we want to be. ‘When you’ve not had a period of success like that then it gets to fans and to anybody and it’s our job to bring that excitement back and to try and qualify. McGregor forms part of a six-strong Celtic contingent still available to McLeish amid the spate of injury withdrawals. 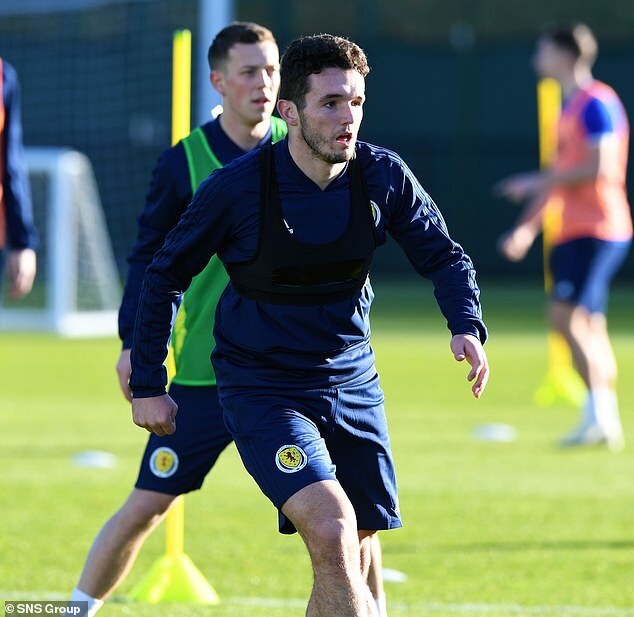 Not used to losing important matches during their double-Treble-winning success under Brendan Rodgers, the midfielder hopes that experience can help lift Scotland. ‘Any player wants to win and be successful and, particularly, the Celtic lads have had massive success in the last few years,’ added McGregor. ‘I think it’s important to try and bring that winning mentality to the squad. ‘I’ve experienced a lot of big games now and I think that helps you. It relaxes you. You know you’ve been in difficult places before and come out the other end having been successful. From a personal experience, the more you see it the more calm you are about it. ‘You play at the highest level for your club and have had tough tests before. It’s an international game but we’ve had tougher tests than that and against so-called bigger nations. Aston Villa midfielder McGinn became the latest to withdraw from the squad. McLeish will not call anyone else up for the trip but may do so for the visit of Israel to Hampden next week. The Scotland boss had previously been left reeling by call-offs from Mikey Devlin, Craig Gordon, Ryan Jack, Jon McLaughlin, Charlie Mulgrew, Kevin McDonald and Stephen O’Donnell. Christophe Berra, Leigh Griffiths, Steven Naismith and John Souttar were already all out injured, while Matt Ritchie and Robert Snodgrass said they did not wish to be considered for selection. James McArthur announced his international retirement and Tom Cairney has not featured since being linked with a switch to represent England.